Get affordable Security Camera Installation on Fountain Valley, CA and CCTV equipment with commercial quality and 2 years warranty. Security is important to ensure the overall safety and possessions. 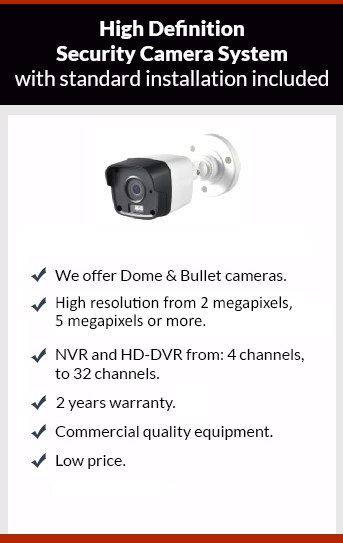 Protection4less knows that security is important we will give you the best security camera system and installation. We install Commercial and residential security camera systems. With a CCTV system and alarm system we think that you’ll have an adequate protection. Throughout commercial properties such as Warehouses, office buildings and retail outlets, all companies require security camera systems. Sometimes CCTV has to be monitored by security guards. The good placements of cameras within all the areas are the key to the security solution. In protection4less we’ll be sure that the location and type of the camera are the right ones according the type of application. Give us a call to get your appointment for your free estimate.